Well I suppose trying to get another glimpse of the SC Top 10 will be impossible tonight as Antonio Brown going to Oakland will be talked about for the next 12 hours. Dexter is a big dude! Torres also made the pass to Dennis. Anyone know the "metrics" for Ricky last night? Recently? It seems like when the ball is in his hands on the offensive end, good things happen a lot more than not...but I admit a bias to liking his game, outside the shooting. Ricky had good moments, but he also had that late game atomic bomb turnover forcing a pass to McDuffie. What am I missing about Antonio Brown? I realize he may be the best WR in the game. Maybe. Certainly top 5. Still, does it warrant "breaking news for 24 hours and maybe 40% of each SportsCenter? I know WSU didn't play great, but how has the Tulane team not won any conference games? They had some talent. They did have some size and talent. I wondered about the no conference wins too. 8. I didn't record it, and if I had...…..
10. "on to Chicago, and let's win there"
1. That game was a huge teaching/learning opportunity for one of strengths of Marshall's teams, particularly the 35-0 team - if/when you get a chance, step on the other team's throat and remove their will/idea that they think they can win. 2. The primary mechanism for that, that I think will come with age and experience, is a little more patience. I still feel like there are a lot of possessions where we're up 9, the other team hits a 3, and we go straight into "I'll show YOU, mutha******!" mode and try to answer immediately when all we need to do is keep doing what we're doing. That's definitely a function of the attitude that Marshall puts in, but IMO you need to put some reins on it. Malcolm and Fred were masters at that. 3. On the flip side - when we're down 9, with a significant amount of time left - it seems like it's worse and we get sped up too much. Nobody likes the momentum going away from them, but if there are 10 or more minutes and 20 or more possessions left in a game we don't need to let sense of urgency spill over into outright urgency/panic and negatively affect the shot selection. Again, that is right in the wheelhouse of what comes with more experience. 5. Trying to avoid being the first AAC team (and maybe ever for a while) to go 0-18... on Senior Night... on national television (I almost put quote marks around national)... against a name brand opponent... my gut says it might not be a stretch to say we got the best 40 minutes that Tulane gave anybody this year. And maybe the best 2nd half by a wide margin, even though we assisted heavily. 6. I could be totally wrong/off on this, but... since there's no round robin in the regular season, and a top 6 finish completely changes your conference schedule in regard to who you play twice next year... did DD's 3 potentially have a HUGE - like 50 NET spots or something huge - effect on our strength of schedule and therefore at-large chances (and seeding) next year? If anybody has the math on what that meant to the 6th vs 7th place teams last year or an estimate of this year, I would be extremely interested. 7. Regardless of whether the ball goes in or not, IPBC causes problems out there. In a good way. 8. If the NIT selection process has ANY aesthetic, philosophical, qualitative, "eye test", "black box", "subjectivity" or whatever other name for the dynamic where they get to select a team or a nudge a seed that might not make sense... you gotta have this team in there. With a good seed and matchup. And that's not the homer in me talking. A nationally prominent program with the 5th(?) longest NCAA tournament streak, F4, 35-0, etc. etc. etc. has nearly complete roster turnover, gets better every month, and goes 9-2 down the home stretch? There's not many storylines worth following in the NIT, but that is one of them. We're in. NIT selection committee - to paraphrase Col. Nathan R. Jessep... You WANT us in that bracket! YOU NEED US IN THAT BRACKET! 9. Final thought - there are a LOT weirder things that have happened in March than a young/growing team that went 9-2 down the stretch stealing an autobid. I'm not sayin'... I'm just sayin. Uncle Mo isn't just driving the bus now, he's welding the Blues Brothers' PA speaker to the top and making sure his East Bound and Down 8 track still works! Time for a big run Shocks. Next year’s conference schedule is not based on this year’s results. The conference will try to create a schedule that gives the best teams the best strength of schedule. If the first place team loses a ton of talent they will get an easier schedule a la WSU this year. I saw more fasns at the Andover Y watching 5 year olds yesterday than that crowd....terrible. 7 and 8 I TOTALLY AGREE WITH...and nice shoutout to COLONEL JESSUP! IPBC would play more if he could just focus on his defense better. When I watch him he always seems like he is adrift. Good defense is more than just guarding your man. It requires anticipation and proper rotation with your teammates. Maybe the light will click on this summer. But the boy has got some major offense skills. His shot looks so sweet. His footwork is great. He needs to get stronger . Hopefully a summer with Kerry R will do it. 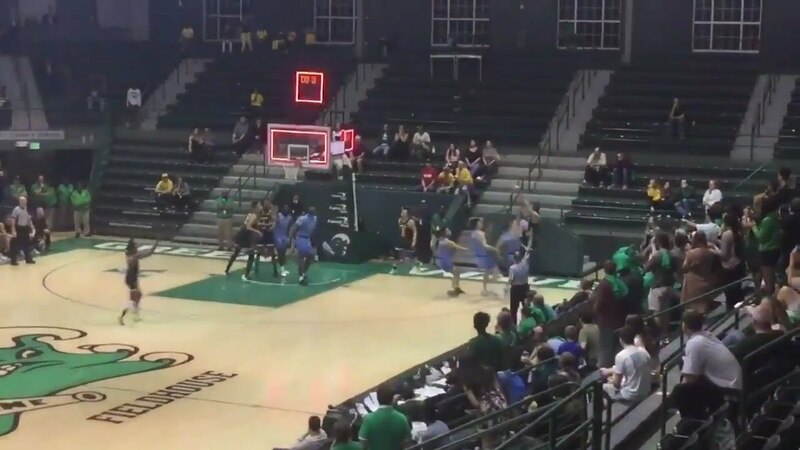 How the **** did Tulane get into this conference? New Orleans is a big historic city. Tulane potentially a good urban basketball school in a state with a lot of basketball talent and only one big time program. On the basis of that a pretty good fit for the AAC. I've answered this too many times before: Tulane Green Wave if you're really interested.